Hope Chapel Huntington Beach has a strong commitment to missions, and to that end, we support and partner with many who reflect Jesus’ heart throughout the world. Our foundation is built upon Jesus’ command in Matthew 28 to “Go into the world and make disciples of all nations”, by teaching biblical truth, relying on the Holy Spirit’s conviction and guidance, and by serving in a variety of roles appropriate to that culture. We believe in developing in-country leaders into effective and healthy ministers of the Good News of Jesus and His saving work. We want first and foremost to be a blessing - to those we serve, the team itself, and the Church. We strive to give others an opportunity to see and experience God’s love in very tangible ways through real people, so we both send and support full-time missionaries, as well as short-term teams to expose others to Christ’s heart for the world, that all may know Him. 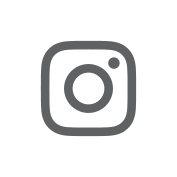 Contact Hope Chapel (714) 536-1614 Click the buttons below to learn more about our local outreaches, our teams and the missionaries we support. Trained staff and volunteers will educate and share with you all the options available regarding your pregnancy. They will walk you through step by step and answer all of your questions. Before making a pregnancy decision it is important to confirm your pregnancy. At Horizon they provide free pregnancy testing. One of their medical professionals will read the results and answer any questions you might have. If you are pregnant you might be eligible for a free ultrasound. Every Thursday during the school year Hope Chapel hosts moms and their children (newborn up to kindergarten) for music, Bible stories, crafts, creative play, and fun. This time is especially encouraging for mothers with young children because our team provides hospitality and refreshments, and a safe place to be with other moms. Also, our outdoor spaces are fully-enclosed, so they can relax for the morning and let their children play with other little ones. The program is free to the community. Nails in His Hands is a construction ministry whose focus is for those with limited or no means, the elderly, single moms or people with special circumstances that live in Huntington Beach. Our goal is to improve the quality of life for those we are blessed to serve. Here are a few of the services we provide: General household repairs, including drywall, electrical, plumbing, stucco, window and woodwork. We also do general inside and outside cleanup, scrub floors, walls, windows, yard clearing and curb appeal. 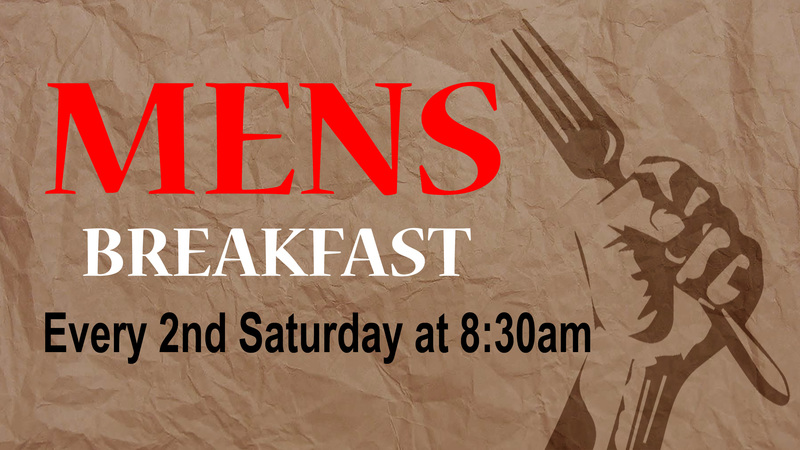 Who can join: Skilled laborers in every area are welcome, but we always welcome those simply willing to serve anywhere they are asked! Garden? Cook? Paint? Re-wire? We definitely need you! Families are more than welcome to come-children as young as 5 often participate. 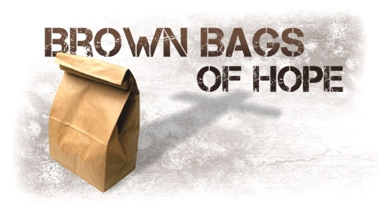 Brown Bags Outreach supplies a complete meal with nonperishable food items to homeless individuals in need. It is a wonderful blessing to give and minister to others in this way. 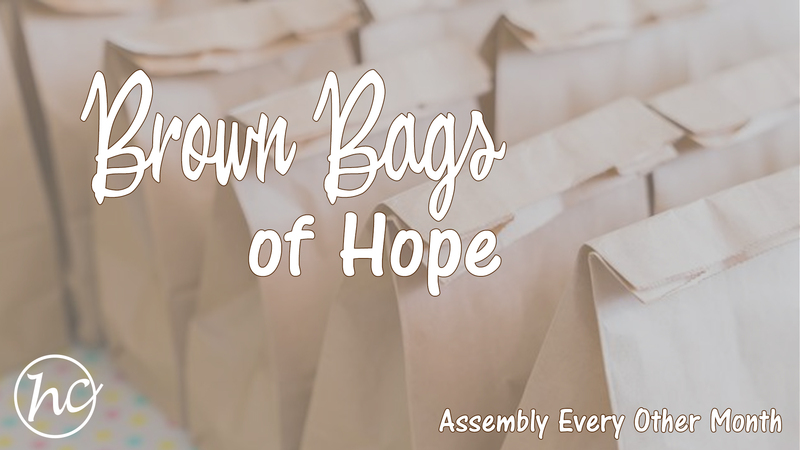 Food donations are collected each month and Brown Bags are assembled at the beginning of the month ready for participators to gather a few Brown Bags of Hope for distribution to the homeless. 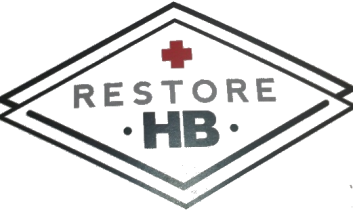 The mission of Restore HB is to show the love of Christ to the Huntington Beach community through the unity of partnership between local churches, engaging in service projects focused on three initiatives: Parks, Neighborhoods and Schools. This year Hope Chapel has been teaming up to clean Murdy Park, local beaches and direct the annual Surf City Alive Sunrise Service. When crisis or disasters hit, our hearts ache and we desire to do whatever we can to comfort with the love of Jesus. Often all we can do is pray that the Lord will send someone to help who is trained and understands how to help victims start to pick up the pieces. Disaster Relief Training teaches the basics of compassionate presence in times of chaos. You can be listed among those who are being deployed into the disaster field with Foursquare Disaster Relief. Upon completion of this course you will be certified through Foursquare Disaster Relief as an official Responder. FDR training is accepted by FEMA. 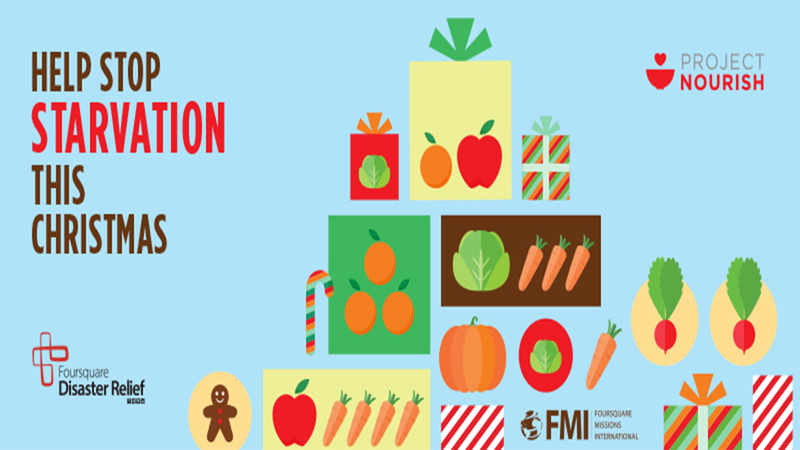 This Christmas, Foursquare Missions International (FMI) is continuing to partner with Project Nourish and our East and Central African leaders, and we are extending an invitation to your congregation’s children and youth to help bring food, hope and Jesus’s love to African children who are facing famine and seeking shelter in refugee camps. Because of your support, Project Nourish has fed more than 25,000 people to date, and we believe with your help, we can feed many more. Each summer, we are blessed to be able to pass on some of the gifts we’ve received as a church, by adopting a missions outreach project either in our area or internationally. The following nations have received Hope Chapel team support: Mexico, El Salvador, Haiti, Nicaragua, Uganda, Great Britain. 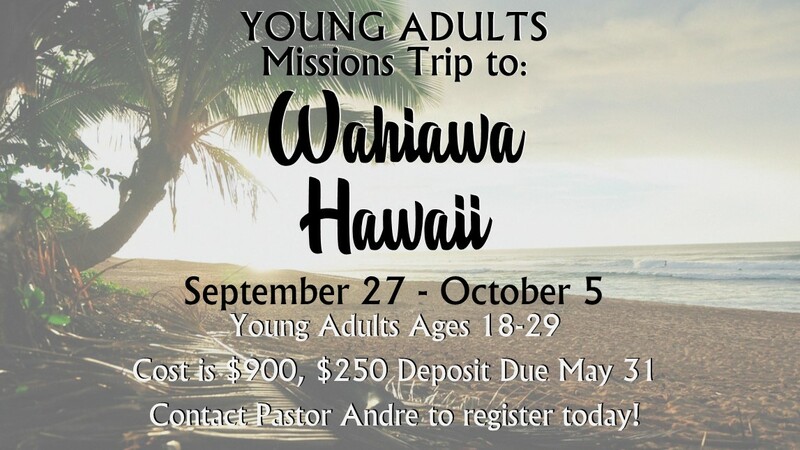 These trips are an incredible way to serve together for the benefit of others. These trips build us into a close community, too – whole families remain close through the training process and long afterward. 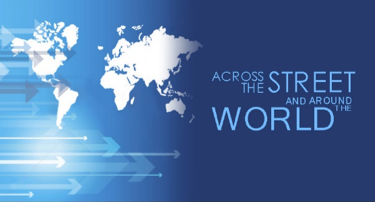 WHERE IN THE WORLD ARE FOURSQUARE MISSIONARIES? 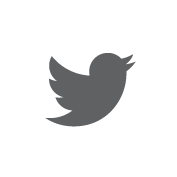 Foursquare has landed in nearly 140 countries. We have some really amazing people stationed around the world with one goal—telling others about the love of Jesus! In obedience to the mandate of Lord Jesus Christ to go and make disciples of all nations, FMI is committed to evangelizing; establishing churches worldwide that are healthy and reproducing; discipling and training healthy reproducing leaders; and facilitating holistic and creative ministry that demonstrates both passion and compassion (serving, healing, teaching and building). 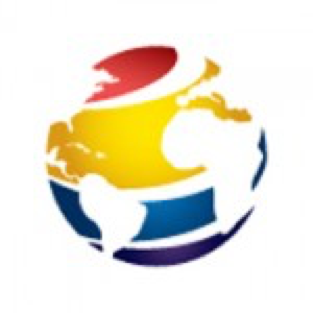 Visit their website: Foursquare Missions International. Click here to get this month’s FMI Prayer Guide. 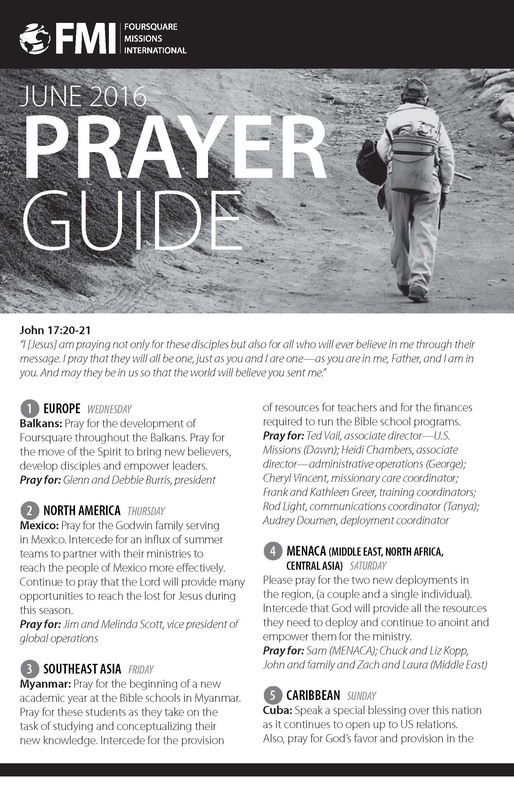 Download the monthly prayer guide to get equipped with how to pray for a missionary or country each and every day. The guides are released monthly, and are ideal for church information tables and church bulletins. 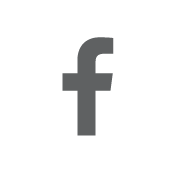 Also, stay up to date on prayer requests by liking FMI on Facebook and following FMI on Twitter.